Wedding or Anniversary – Remember that time your husband bought you a gym membership and affectionately grabbed your side pudge. Or when your wife re-gifted you some nuts she got for Christmas, even though you hate and are allergic to nuts. It’s time to return the favor with some flavor! 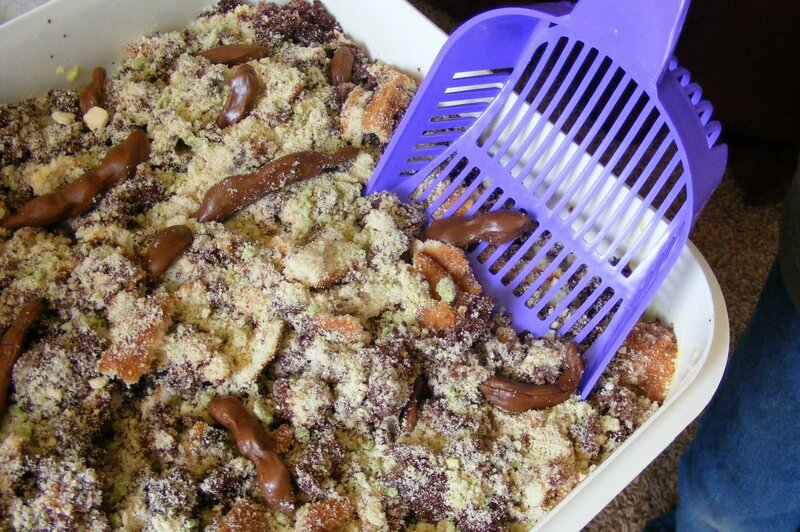 Baby Shower – What’s better than a kitty litter cake to celebrate a new life being brought into this world? Pregnant mother’s everywhere have been avoiding this pungent house-chore. There is no better way to remind her after she pops, it’s back to the poop scooping committee (don’t forget diaper changing too!). That’s a lot of poop. Birthday Party – Little Bobby is turning 9, he was super stoked to be getting a Batman/Superman spinoff cake for his Super Hero themed birthday party…but instead you went above and beyond his expectations with a kitty litter poop cake. Oh the memories you’ll scoop. 1. Prepare the cake mixes – don’t worry about pan shape or size, they will not be prepared the contemporary way. 2. Prep the pudding and chill in the fridge! 3. Crumble the cookie sandwiches with anything from a kitchen mallet to your fist. You will need about ¼ a cup. 4. Add a couple dots of green food coloring to your crushed cookie sandwiches. Mix or shake. 5. Crumble/mix the German and white cakes together. Add colored crushed cookie sandwiches into Kitty Litter pan. 6. Microwave tootsie rolls until pliable. Stretch and contour like kitty poop. Add to kitty litter and cover in “litter”. So Monkey Picklers, where would you serve this cake?